I stumbled upon a free website made for Phangan Jetski based in Thong Nai Pan Yai the other day. The site is really bad and obviously ignored by the person who made the site as it is full of spam comments. Moreover, the website is misleading in the extreme as in the video section they have a video of jetskiing with dolphins. Unless you click through to YouTube you won’t discover that the video was actually taken in the Maldives not Koh Phangan! This flagrant misrepresentation sums up the jetski experience not just in Thong Nai Pan and Koh Phangan but throughout Thailand. 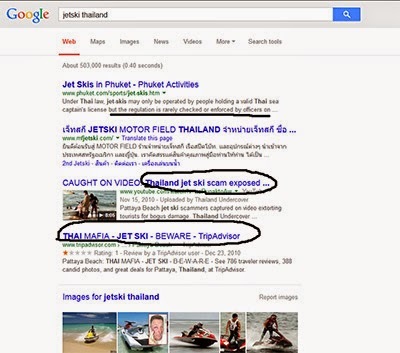 If you don’t believe me Google the term ‘jetski Thailand’ All 10 entries on the first page catalogue the numerous scams perpetrated by jetski companies. Operators are meant to have a captain’s license, but the police never check. In Phuket the mafia control the jetski business. You can see a YouTube video that shows a scam in action. A very minor scratch is treated as major damage – Thais crowd the foreigners and start shouting in order to scare the money out of the tourists. A cop then turns up and arranges a small discount. He is in on the scam. I was going to post pictures of jetskis in the water in Thong Nai Pan, but thought this will just encourage people who look at pictures without reading the text. Don’t hire jetskis in Thong Nai Pan. They pollute. You can smell the petrol fumes from the jetskis. They are dangerous. Jetskis coming and going pose a threat to people swimming in the sea, especially children who are harder to see and who don’t instinctively get out of the way. Going out to sea in a jetski is also dangerous as the coastal waters contain lots of rocks just below the water. It doesn’t matter if you rent a jetski from a foreigner or a Thai person the result of scratching the jetski is the same: they will refuse to return the passport until they have $1,000 in cash. A scratch costs only a few hundred Baht to fix, and can be done simply. The police won’t help you. Your resort manager won’t help you. The only thing that will help you is having 2 passports! Most people don’t go anywhere on a jetski. They simply circle around the bay and then come back. People stop to stare at you jetskiing not because they think you are cool, but because they are wondering why any idiot would want to make so much noise and cause so much pollution in such a lovely spot. Please save yourself heartache – don’t rent a jetski in Thong Nai Pan. It is illegal to demand a passport as a deposit in Thailand, as a foreigner should have his or her passport nearby at all times. Saying this won’t help you when hiring a jetski but it should alert you to the fact that the really precious thing is the passport not the jetski. In fairness to Phangan Jetski they claim to offer the option of buying insurance. Who underwrites the insurance is not revealed. It is just stated that 80% of damages are covered. Whether that means the amount asked for is only $200 instead of $1,000 is unclear. Also in fairness to Phangan Jetski they have some good reviews on Trip Advisor – indeed 19 good reviews. However, the bad review mentions paying 900 Euros for a jetski that sank – the tourist was picked up by a fishing boat!